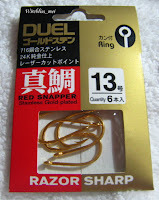 I went to the fishing tackle shop this afternoon and bought this packet of gold plated fishing hook. The idea that came to my head when I saw the hook is a fishing hook earring. 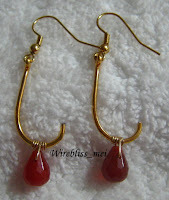 Here are pics showing the sequence in creating this earring. Very sharp hook, as indicated on the packet - RAZOR SHARP. The sharp ends were cut off otherwise someone might get hook at the wrong places...ouch! Excuse the hairy part. That belongs to hubby. Can't find anyone to model for me so he is the easy "victim". Oh yes! He got pierced earlobe. This is just an experimental piece. One thing for sure, the hook is veeery hard. That is why I have second thought about subsequent pieces.